I’ve been using Google for years. Then Google gave us Gmail. It’s not my main email client, but I use it. Then Google gave us Picasa, Chrome, YouTube, Music, Picnik, Maps, Earth, Reader, Google+, and over time I’ve become Googlefied. I started storing content on the net with Gopher and began developing web pages when Mosaic came out. I’ve always kept my favorite bookmarks on a file I coded in HTML and used it as my home page in all my browsers. I had set up iGoogle years ago but never really committed to it because I loved my own homely home page. 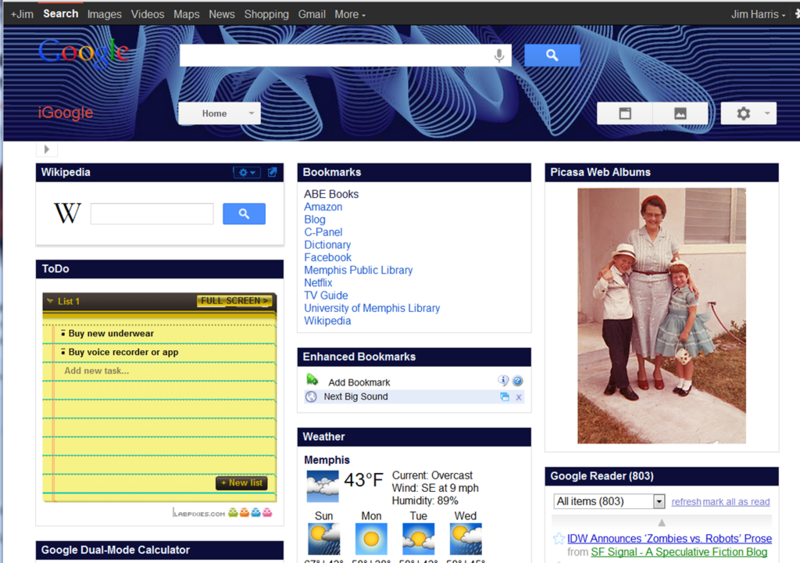 This morning I started playing iGoogle again and decided to make it my home page for Chrome. Chrome is my default browser at home, but I also use IE 9, FireFox and on rare occasions Safari. We’re all moving to the cloud. Some people might not know it yet, but we’re all moving to the cloud. Any device with a IP address is on the Internet. Programs and content stored on devices you own are local. If you store you primary copy of data off your local device you’re living in the cloud. Most people find that scary. I do too, although I’m willing to give it a try, so I’m moving my data to the cloud but I’m keeping backups local. Think of me as a belt and suspenders man, at least for now. I’m going to write a series of posts about living in the cloud and review programs and services that I find worthwhile. My first step is exploring Google’s cloud offerings. I’ve already put my songs in Google Music. I can play them on my PCs, Mac and Linux boxes at work and home, and on my iPod touch and iPad. I’ve also started uploading my photos to Picasa’s online storage. The thing about moving to the cloud is committing to a company that hosts the servers. The big choices now are Google, Microsoft, Apple and Amazon. The first three also have their own browsers. (Maybe Amazon should align itself with FireFox.) I have content with all four companies, and moving to the cloud implies I expect these companies to stay in business for the rest of my life. I’m not sure which company will become my primary cloud home, but I’m going to test them all. I’m starting with Google, and to show my commitment I’m setting iGoogle as my default home page. It allows me to customize my home page extensively with a variety of widgets. Here’s my first effort. Because Google is pushing Google+, it’s revamped it’s many separate tools into a toolbar that Googlifies everything. From this home page I can search Google and Wikipedia, click on links to my favorite sites, see Gmail, RSS feeds, weather info, do math, get driving directions, search YouTube, and every thirty seconds be visually reminded of a different moment of the past. Plus, I have a pull-down menu to a vast array of other Google features. If I click on the photo it takes me to Picasa web, where I can click on a photo edit button that brings up the wonders of Picnik photo editing. All the companies that Google has bought over the years is finally coming together in one command center. Oddly enough, there’s no widget for Google Music. Google needs to add a Google Music Player widget. If I kept my Chrome window opened to full-screen I could even use 4 columns of widgets. iGoogle provides very flexible screen layout options and colorful themes. iGoogle is a cloud portal tool, a feature that Microsoft, Amazon and Apple don’t have, and puts them at a disadvantage. This matters a lot if you’re using multiple computers, and too a lesser degree if you’re using smartphones and tablets. I have a PC, HTPC and Linux workstation at home, and a PC, Mac and Linux workstation at work, plus I have two mobile devices, an iPod touch and iPad. This provides a tremendous incentive to put my digital possessions in the cloud. My photos and music are available to all my devices at any location. I have Microsoft Office on my PCs and Mac, and have a nice Outlook client on my iPod and iPad, and hope to have Office apps on my iPad soon. I’m very Microsoft centric when it comes to productivity programs, and Microsoft offers various Live apps that are starting to compete with Google’s cloud tools, but it doesn’t have a portal like iGoogle. I can store photos on SkyDrive but it’s not the same. Microsoft has no cloud music like Amazon and Apple does. But it is obvious that Microsoft is getting serious about the cloud. Amazon and Apple are really lacking when it comes to furnishing a cloud home base. They are more like mini-storage rental sites, where they will keep all my junk. Amazon’s portal is it’s front page, and Apple’s portal is iCloud, but it’s home page is very limited compared to iGoogle. (How did Apple let Google have the i-name?) Apple assumes people live on their iPhone, iPad and iMac, and everything else doesn’t matter, but I’m not ready to ditch Windows, Linux and Android. iGoogle isn’t slick like Apple products. It’s not even as slick as Microsoft programming. I’m hoping some of the technology they bought with Picnik might jazz up Google’s cloud apps in the future. iGoogle is good for people who want to work over the widest range of platforms. If you’re a Apple true believer, it won’t matter. If you’re totally devoted to Amazon and Kindle, it might not matter. But if you live in a world of PC, Mac, Linux, iOS and Android, then it’s well worth a look. Not only does living in the cloud offer cross-platform sharing of data, it also backs up data. If your house burns down, your digital belongings are in the cloud. Eventually I want to replicate my data across two or more cloud servers to have even more protection, in case one company goes out of business or suffers a prolong outage. Switching to iGoogle is just the start. I don’t know about the rest of those, Jim, but Google didn’t bring us YouTube. They just bought YouTube in 2006. I’m not a fanatic about it. But I use open source software – Firefox, Thunderbird, Open Office, etc. – whenever possible, just to help ensure there’s always another option. I like open source tools too. Yeah, many of the apps that Google provides for us were not developed in house, but were bought, like your Blogger site. But I still feel it’s a gift from Google because they bought and support this stuff, and they are trying to integrate it all together. Open source people can’t afford to provide free cloud services though, so I have to support one of the corporate giants. But Bill, you only use one computer, right? And you’re not into music. So you might have little need of the cloud. Of course, if you use Blogger’s editor, then you’re using a cloud program. As someone that just lost his hard drive again. The cloud is looking like a better and better thing. I’m not sure I want to know that you need new underwear. I left that in to see if people would notice. BTW, I did order my underwear last night. iGoogle is a good place for a To-Do list. In an earlier version of the image, if people looked close, they could see a piece of Gmail where I saved my Wi-Fi password. I had to redo the image, but I intentionally left in the underwear reference to see if anyone noticed. Mike, you win the prize. I’m going around now trying to set up Chrome on all my various desktops. Next you will be telling us that you bought iUnderoos. If I thought it would get a laugh, I would. I’ve seen so many technologies come and go – it is hard to keep up with all of the formats and devices. I’m not using ‘the cloud’ yet for anything except my online sites. I’m not sure I trust the big guys to keep offering their services in a way that is compatible with my desires and my wallet! I think what pushes me into exploring this new territory is I have too many computers. Having a file on DropBox, or saving notes on EverNote, is a convenience. So is having access to my CD collection online. I’d hate if these services disappeared. But they might. I started playing around with iGoogle after reading your post. I had attempted to do it a couple of years ago but did not work out for me. Now I added the Toodledo gadget which i use on my iPhone and it works pretty well. Also gmail, reader. For Bookmarks i am not convinced it works. Also as far as Calendar is concerned, i am still trying to figure out if its possible to show the Toodledo task on the actual Calendar instead of just the taskbar. No luck yet. The great thing with this, is that like you i want to be device independent and synchronising so far works perfectly. I was also using to Toodledo for almost a year, but recently stopped. I don’t think I’m psychologically attuned to that kind of To Do list. It’s a great program though. I’m now experimenting with keeping a diary in Word on Dropbox versus keeping a diary on Evernote, but the simple To Do list gadget in iGoogle is always in front of me, so it’s having its impact. There are two, and maybe more, kinds of bookmarking gadgets in iGoogle. I used the one called Bookmarks for everyday links because it alphabetizes. I use another one, Enhanced Bookmarks for just remembering an occasional use bookmark because it’s quicker to add a bookmark, but it doesn’t alphabetize the links though. All of this is experimental. I testing stuff to see how it integrates into my normal routines. Another thing I’m testing is an app called Recorder for iOS on my iPod touch to make voice notes. It’s easier than typing. Recorder will even email a file of the voice recording so I can use it on my computer. Toodledo has a gadget which works on iGoogle and it’s pretty good. Now i can also see the tasks on the Google Calendar as well. Excellent synchronising so far. Are you using multiple tabs on iGoogle or just home? I have multiple tabs but i am thinking whether i should stick to just 1 page instead. Now that’s very interesting, maybe I should revisit Toodledo. I have Outlook at work, and Outlook Calendar on my iPod touch and iPad. Outlook has Tasks for To Do lists, and when I first got Toodledo iOS didn’t synchronize to Reminders, but now it does, so I’m going to start using that, but having a widget on iGoogle is tempting. I’ll have to see if there’s a widget for Tasks. Microsoft needs to get on the stick and create a web portal like iGoogle, and get all its Office functions on apps. If they did, that would sway me away from Google, their archenemy. I don’t know if the average computer and smartphone user realizes their’s a battle between Microsoft, Google and Apple for users. Our university recently moved all our email to Microsoft servers and we have access to Outlook.com and SkyDrive, so tens of thousands of users were added to the Microsoft system. Google wanted us too. Everyone is fighting for users. Outlook.com/Live.com/Skydrive is pretty far from a web portal like iGoogle, but it’s moving there. Right now personally, I’m using more Google products, but I love Office, and that might move me into Microsoft’s cloud. Amazon does have a browser now.